A 5-year-old boy with a heart condition said his dream was to become a ninja. 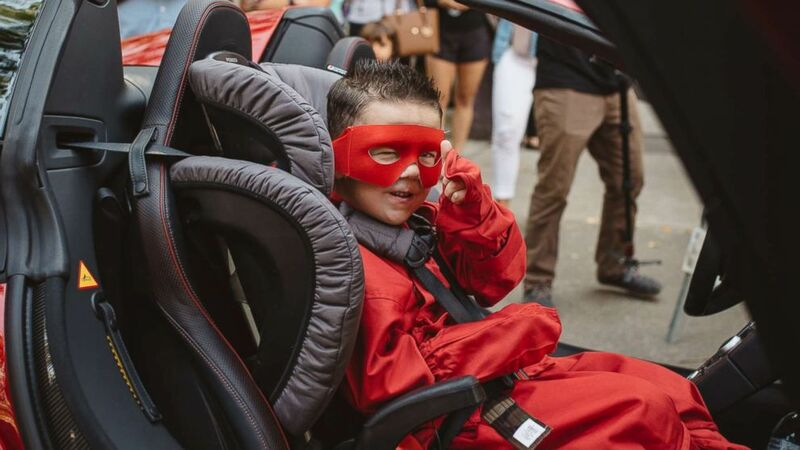 The community of Sacramento, California, pulled together to help a boy with a congenital heart condition fulfill his dream of becoming a real-life ninja. Bryant Mordinoia, 5, was diagnosed with his condition the day he was born, his father Justin Mordinoia told ABC News today. When asked what he wished for by the Make-A-Wish Foundation of Northeastern California and Northern Nevada, Bryant immediately said he wanted to become a real-life ninja because "ninja's fight bad guys." "He’s the sweetest kid, he doesn’t have a mean bone in his body," Mordinoia said of his son. "He is a very loving kid, a little bit shy. He's opening up today ... he's having a blast." "He had his first open heart surgery at two months old," Mordinoia added. Bryant was scheduled to have another open heart surgery this year, but his father said doctors pushed it back in hopes that he could grow a little stronger first. (Xsight Photography Michele Flynn) The Make-A-Wish Foundation helped Bryant Mordinoia go through ninja training before taking to the streets. Mordinoia added that Bryant has been obsessed with the Lego Ninjago movie. "If we’re at home, and Netflix is on, if its not Lego Ninjago there's a problem," Mordinoia added. "He walks around the house kicking and punching." 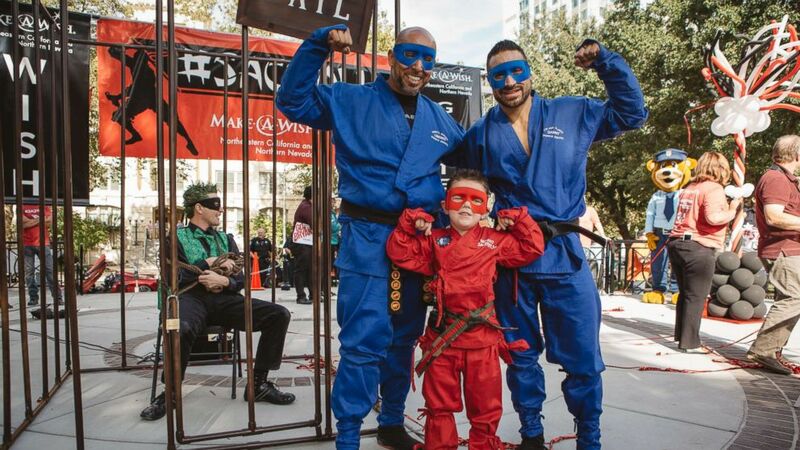 The Make-A-Wish Foundation set up ninja training for Bryant and then called on community members to come cheer him on as he saved Sacramento from an evil villain. Bryant will be "called upon to save Sacramento and chase the villain around town with action-packed altercations," the invitation from the Make-A-Wish Foundation stated. Throughout the day, Bryant helped catch a villain who tried to steal an elderly woman's purse outside of the Bank of the West, and then helped free a police officer who was held hostage by the villain in a series of elaborately orchestrated showdowns by the Make-A-Wish foundation and with the support of the community. (Xsight Photography Michele Flynn) Bryant Mordinoia, 5, is battling a heart condition and wished for one thing: to be a ninja. "He won't stop talking and is loving every minute of it," Mordinoia said of the festivities for Bryant held today. Mordinoia added that the support his family has received from the community went "over and above" what he expected, saying that hundreds of people came to cheer Bryant on as he fought off bad guys. "I didn't expect it to be half of what it is now, there's hundreds of people here," the father said. 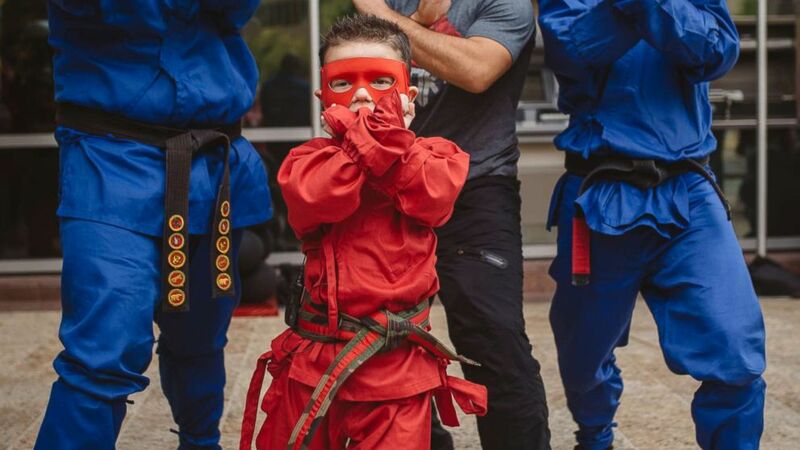 (Xsight Photography Michele Flynn) The Make-A-Wish Foundation of Northeastern California and Northern Nevada granted the wish of 5-year-old Bryant Mordinoia, who wanted to become a ninja for a day.